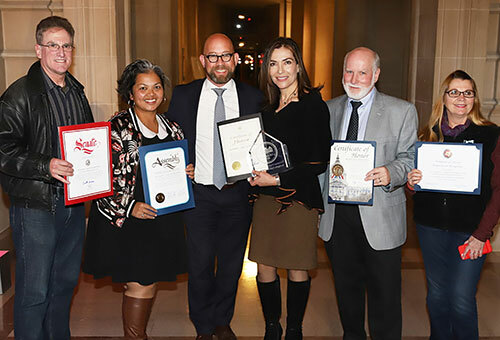 Upper Noe Neighbors and Upper Noe Rec Center accepted the 2019 Neighborhood Empowerment Network award for Extraordinary Neighborhood Block Party and civic honors for their work putting together Ten Together- Upper Noe Block Party at the Rec Center on September 15. Right: Dave Emanuel, Sam Shakur, Rafael Mandelman, Olga Milan-Howells, Chris Faust, Cheryl Woltjen. Upper Noe Neighbors meets Wednesday, March 20 at 7 p.m. at Upper Noe Rec Center. The agenda includes Annual UNN Board elections, updates from Supervisor Rafael Mandelman, and Disaster Preparedness. Registration for Spring Activities opens on March 2 at 10 a.m. The only change to our schedule is that Girls Beginning Volleyball for age 7-9 moves from Thursdays to Wednesdays from 4 – 5:30 p.m. Visit sfrecpark.org to add courses to your Wishlist now.. Registration opens March 16 at 10 a.m. Early birds, the registration process at the Rec Center now requires you to be physically present in line. “Saving spots” with chairs or other items is not permitted. Come on out on Saturdays between 9 a.m. and 3 p.m. for San Francisco Youth Baseball and cheer on Upper Noe Thunder as they compete on our field. Rec & Park inspectors recently gave our outdoor basketball court a failing grade. The blacktop surface serves many purposes, including our skateboarding program. It is so cracked that these activities have become hazardous. It has been in such bad shape that Rec & Park will not even paint new lines for basketball even though the paint has faded completely. Our understanding was that a failing grade would rapidly lead to maintenance but apparently money will not necessarily come from Rec & Park anytime soon. Parents and neighbors need to speak up and demand that Rec & Park remedy the situation so that we can have a safe and functional outdoor play space. Please call 311 or go online to SF311.org and report your concerns. That is the best way to get your message through to the City. Learn about Ellis Act evictions, who is at risk and what rights you have as a tenant. Thanks for your interest and support of your park! Please email info@noevalleyreccenter.com with any questions or suggestions. Share this newsletter to your friends and neighbors.